"Imagine some national (and probably global) volcanic eruption, initially flowing along channels of distress that were created during the Unraveling era and further widened by the catalyst. Military distress, with war against terrorists or foreign regimes equipped with weapons of mass destruction"
When you read pertinent passages from Strauss & Howe's prophetic assessment of history from a generational perspective, eighteen years after its publication and seven years into the Crisis they forecasted with uncanny accuracy, you find yourself shaking your head and appreciating their visionary generational appraisal of antiquity. Those who scorn The Fourth Turning either haven't read it, are ignorant of the cyclical nature of history, blindly believe in never ending human progress, or their salary is dependent upon not acknowledging the truth. A year consists of four seasons - Spring, Summer, Fall, and Winter. A long human life of 80 years consists of four phases - childhood, young adulthood, mid-life, and old age. Human beings tend to associate themselves with the cohort born within the roughly 20 year period that makes up one phase of life. Members of a generation share an age location in history, tend to share some common beliefs and behaviors, including basic attitudes about risk taking, culture and values, civic engagement, family life, and tend to have a sense of common perceived membership in that generation. The generational attitudes, moods, leaders, and events that occur during recurring 80 year cycles drive the pathway of history. Strauss & Howe have been able to document the Turnings of Anglo-American history back to 1435. Like the seasons in a year, there have been cyclical turnings every twenty years or so for centuries. They can be described as High (Spring), Awakening (Summer), Unraveling (Fall), Crisis (Winter). Each turning is a reflection of generational interactions, moods, and attitudes. We are now seven years into a Crisis that will likely not climax until the late 2020's. Millennial (2025?) Global Financial Crisis (2008-2029?) 81 years? The beginning of the new year has seen the usual avalanche of 2015 forecasts from mainstream media pundits, Wall Street gurus, Ivy League economists, journalists and bloggers. Most are paid to produce forecasts which promote their employer's agenda; convince readers to buy their investment products, newsletters, or service; propagandize the government storyline; or validate their Ivy League academic theories. Those in the employ of the Deep State always produce forecasts of economic growth, positive developments, and never ending progress. They've never seen a recession coming, the stock market declining, or war looming. None of these people saw the 2008 Financial Crisis coming. They all believe 2015 will be a great year. They are narrow minded linear thinkers who are willfully ignorant of history or purposefully peddling propaganda for a paycheck. Making annual forecasts in the midst of a 20 year Fourth Turning Crisis is rather pointless. Predicting improvement or progress in the midst of a Crisis is nothing but a futile exercise in mental masturbation. Fourth Turnings, like a protracted, brutal, frigid, gloomy, stormy winter of discontent, may have an occasional let up in intensity, but will rapidly revert back to turbulence, danger, and volatility. When I wrote Fourth Turning Accelerating in June of last year, I made the case that core elements of this Crisis - debt, civic decay, and global disorder - were combining to provide an impetus to the next dire phase of this relentless blizzard of pain, suffering, chaos and war. "Reflect on what happens when a terrible winter blizzard strikes. You hear the weather warning but probably fail to act on it. The sky darkens. Then the storm hits with full fury, and the air is a howling whiteness. One by one, your links to the machine age break down. Electricity flickers out, cutting off the TV. Batteries fade, cutting off the radio. Phones go dead. Roads become impossible, and cars get stuck. Food supplies dwindle. Day to day vestiges of modern civilization - bank machines, mutual funds, mass retailers, computers, satellites, airplanes, governments - all recede into irrelevance. Putting forecasting into perspective during Fourth Turnings is easy when you have a grasp on history. Imagine there were pundits pontificating on CNBC or CNN in 1936, the seventh year of the Great Depression Crisis or 1780, the seventh year of the American Revolution Crisis. Most historians refer to the Great Depression as the period from the Great Crash of 1929 until our entry into World War II in 1941. Annual forecasts of improvement would be meaningless to people living through this brutal period in our history. If Jim Cramer was assessing the period from 1934 through 1936 on his daily radio show, he would have been gushing about GDP growth of 10.8%, 8.9% and 12.9%. He would have been effusive about the 300% surge in the Dow Jones Index from the 1933 low to the 1936 high. CNN would be doing special reports about the tremendous success of New Deal programs, as Federal spending and handouts accounted for the entire surge in GDP. But, in reality the average American continued to struggle to survive, as unemployment ranged between 17% and 22% during this time and only the rich owned stocks. Another 10 years of hardship, war, and death on a grand scale awaited them. Perspective and context are essential when attempting to assess periods in history. You get no context from the entertainers passing for journalists in today's world. The beginning of 1780 saw Washington and his troops surviving the harshest winter of the 18th Century in Morristown, NJ as the 5th year of war still left the outcome highly in doubt. CNN would have blamed the polar vortex for the temporary lull in patriot fortunes. Defeats in battles against the British in South Carolina and the uncovering of Benedict Arnold's plot to surrender West Point to the British would have been spun as minor setbacks. Cornwallis' surrender at Yorktown was almost two years away. The Articles of Confederation hadn't yet been signed and the U.S. Constitution wouldn't be signed until 1787. The Crisis wouldn't end for another fourteen years, in 1794. Fourth Turnings have their own rhythm and pace. The reactions to events and mood changes of generational cohorts interact to provide the dynamic that drives Fourth Turnings. The specific events are not foreseeable but human weaknesses, faults, flaws, failings, strengths, intellect, and emotions are consistent across the ages. Human nature does not change, therefore it is predictable. Those who wish for this Fourth Turning to accelerate and get to the climax sooner may want to rethink their desire. The Civil War Crisis was accelerated because all parties were intransigent and unwilling to compromise or pause. The result was 700,000 Americans killed in four years, representing 5% of the entire male population. This Fourth Turning could be accelerated with the push of a button and millions killed in an instant. I don't think anyone wants that kind of climax. We are entering a banquet of consequences where our choices will make a difference. Just as you can't turn the clock back to the glorious warm days of Summer or the delightfully pleasant cool days of Fall, the dark, foreboding, bitter days of Winter will bring forth raging blizzards, dangerous sub-zero temperatures, and vicious gale force winds. And there is no way to avoid, sidestep, or escape the trials and tribulations which will sweep away the existing social order and replace it with something better or possibly far worse. There are no guarantees this Crisis will resolve itself in a positive manner. The spark that catalyzed the Crisis mood in 2008 was the global financial implosion caused by Wall Street bankers committing the greatest control fraud in world history, corrupt captured politicians' spineless failure to address the nation's spending and debt problems, and the Federal Reserve creating a housing and stock bubble through their loose monetary policies and complete failure to regulate the Too Big To Trust Wall Street banks. The inability of the linear thinking ruling class to acknowledge the seriousness of our current circumstances and the implications of the era of depression and violence the country is about to experience can be witnessed on a daily basis by listening to mainstream media talking heads or politicians of all stripes who bloviate about economic improvement and progress just ahead. "THE SHADOW OF CRISIS HAS PASSED"
Do Obama and his advisors actually believe this Crisis is over? Or is he purposely misleading the American people about the seriousness of our circumstances because he has been instructed to do so by the men who really pull the levers of this country - Wall Street bankers, shadowy billionaires, and the military industrial complex. If the Crisis has passed, why has the 30 year bond yield fallen to an all-time low? Why does the Fed maintain an emergency stance by continuing to keep interest rates at 0% if the economy is really growing at over 4%, unemployment has really fallen from 10% to 5.7%, corporate profits are at all-time highs, and the stock market has risen by 200% to record highs? In Part Two of this article I'll prove the shadow of crisis has not passed, and the core elements of Crisis - debt, civic decay, and global disorder - get worse by the hour. We have seen this film before. The US Congress is threatening a trade war to punish “currency manipulators”, those it deems to be boosting their trade balance artificially at the expense of America. Ordinarily, a threat of legislative action like this folds in the face of a presidential veto. In the past this has resembled a good cop-bad cop routine. The White House would point to anger on Capitol Hill in order to persuade the likes of China and Japan to curb manipulation against the dollar. This time, however, the number of Democrats and Republicans pledging their support for legislation looks unusually potent. President Barack Obama rightly insists that dealing with currency devaluation should be separated from matters of trade. He must hold firm both on the Trade Promotion Authority he seeks from Congress — that enables him to submit “fast track” deals to an up-or-down vote — as well as the Transpacific Partnership talks that are in their final stages. Both Atlantic and Pacific trade deals are at a crossroads. It would be a setback to global growth prospects if they were sabotaged by politics in the very country that initiated them. However, Mr Obama should take nothing for granted. John Boehner, the Speaker of the US House of Representatives, has said he needs at least 50 Democratic votes to pass TPA. Yet 150 of the 188-strong Democratic caucus have already signed a petition opposing it. Unlike on previous rounds, they are joined by a growing number of Republicans who object to anything that increases Mr Obama’s authority. Their motives may be different. The left smells a multinational rat that would gnaw at US labour and environmental standards. The right wishes to poke Mr Obama in the eye. Combined, they are an unholy alliance capable of wrecking global trade negotiations. The main problem is that such a measure is unworkable. It would slap duties on imports from countries deemed to be manipulators, this being defined as central bank interventions aimed at providing a currency subsidy. In practice these are hard to prove. One person’s devaluation is another’s monetary policy. It could also rebound on the US. Many, including China, objected to the US quantitative easing programmes on precisely such grounds. The US is now complaining about the impact of the European Central Bank’s QE. Both actions were launched to stimulate demand but also boosted exports. Deciding which are manipulations is not a precise science, as the IMF has made clear. Shunting adjudication to the World Trade Organisation would not alter that objection. The second problem is that it would ruin any chances of a trade deal. The 13-member TPP talks are nearing conclusion. If Congress inserted a currency clause into the final deal it would prompt Japan to abandon the process — and possibly others. The same applies to the Transatlantic Trade and Investment Partnership talks, which are at an earlier stage. Germany’s record export growth is partly helped by the euro’s recent depreciation. Any measure that punished the eurozone for its currency’s downward drift would only hasten the protectionism US lawmakers say that they are trying to stop. The dollar is currently riding high because US growth outpaces most of its partners. If the recovery has returned fewer middle class jobs than hoped to US shores, it is because of automation, not competitive devaluation. In any case, trade is not the forum with which to address US currency concerns. Mr Obama knows this. So do cooler heads in Congress. Let us hope they prevail. Agnico Eagle, Coeur Mining, Gold Resource and Newmont Mining can outperform amid supporting trends. The gold pullback may prove temporary as negative global nominal interest rates and policy skepticism should drive support. While upside U.S. employment surprise may have shifted market anticipation on Federal Reserve policy action towards an initial interest rate move higher, we contend other macro and micro trends should continue to provide support for gold prices. 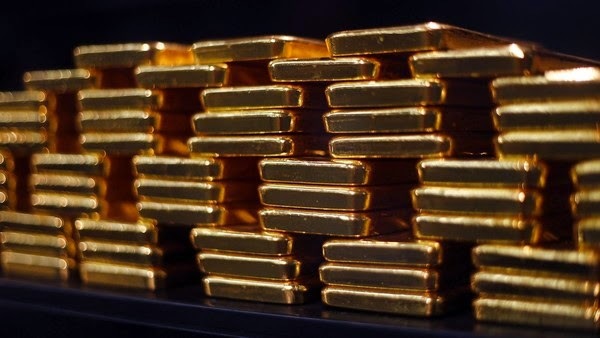 Accelerating monetary policies pushing negative real and nominal interest rates through global central bank balance sheet expansion driving higher non-dollar gold prices, supportive gold central bank, physical demand, and technicals should allow prices to recover from pull trends. As mining-management teams continue to communicate with investors, cost and capital successes and goals show a more sustainable business model going forward; we believe selected gold equities can outperform. We rate Agnico Eagle Mines, Coeur Mining , Gold Resource and Newmont Mining as Buys with Barrick Gold , Hecla Mining and Pan American Silver as Neutral. We continue to recommend Newmont Mining among large-capitalization producers, Agnico Eagle among mid-cap gold companies, Coeur Mining among silver-oriented miners and Gold Resources among small-cap gold producers. We believe stronger U.S. dollar, global central bank withdrawals of liquidity and a reversal of net bullion purchases, a higher level of positive real interest rates, further delayed timing of development projects and higher-than-expected cost pressures could impact our valuation views. Although many market participants appeared a bit more convinced of the implicit strength in the latest jobs report, our Chief Economist Lindsey Piegza believes that the recent jobs report was unable to instill confidence in an improving quality of job creation in the U.S. Thus the underlying juxtaposition for the Fed remains: strong payrolls implying a need for liftoff, and still lackluster wage and quality job creation implying the need for further accommodation. Lindsey remains convinced the Fed is still leaning towards the latter. She believes the Fed will remain patient, waiting for realized improvement before adjusting monetary policy. While U.S. is moving towards a tightening cycle (we expect a rate increase in 2016), major economics such as Europe and China continue to pump liquidity into their systems. Last week, China’s central banks cut the amount of cash that banks must hold as reserves, the first industry-wide cut since May 2012. Last week, the new government in Greece dropped calls for a write-off of its foreign debt and instead proposed official creditors swap debt for growth-linked bonds. Despite that, there is a growing concern amongst economists about the risk that Greece exits the Euro-zone. Crude is India’s largest import item by value, followed by gold. Together they account for almost half of the country’s imports. The steep decline in crude prices has lowered India’s import bill considerably, to the point that the country recently lifted some of the import restrictions on gold. Given improvement in current account deficit, industry sources believe the government may consider 2%-4% import duty reduction. Energy represents 20%-30% of gold miners’ operating costs. The recent 50% decline in energy costs has helped gold mining companies trim costs across operations on their unhedged position. We estimate that domestic and contractual labor, and local administration costs, all paid in local currency, make up 25-50% of a gold miners’ operating costs. Australian, Canadian, Mexican currencies have dropped nearly 10%-15% since June 2014. Unhedged currency exposure could have meaningful impact on operating & capital costs.